of weight reduction and aerodynamics, handling all at a preferential price. ✔️ This bike front fork is very easy to install and suitable for road bikes. Full carbon fiber construction is lightweight plus helps smooth out the road and enhance durability. makes such a world of difference in a road bike's performance. anew all your favorite routes. ✔️ Best Material, Best Design, the Best Product, for Best you! 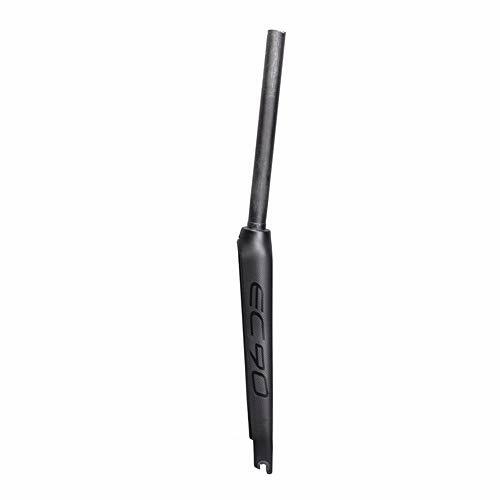 EC90 Full Carbon Fiber Road Bike Front Fork delivers an incredible combination of weight reduction and aerodynamics. Full carbon fiber construction is lightweight plus helps smooth out the road and enhance durability.Going the full carbon route -- both fork blades and steerer tube - makes such a world of difference in a road bike's performance. This bicycle front fork will upgrades your ride quality if you use it as a road bike front fork. It provides excellent work, easy to install and disassemble.It delivers an incredible combination of weight reduction and aerodynamics, handling all at a preferential price. Our high quality and cost-effective products are the best choice for you.Best Material, Best Design, the Best Product, for Best you! If you have any questions about this product by EC90, contact us by completing and submitting the form below. If you are looking for a specif part number, please include it with your message.